I know the idea of making an extra-small quantity of something as delicious as brownies seems counter-intuitive, but really, it makes perfect sense. Unless you have the metabolism of a shrew, you probably don't want to eat a whole pan of brownies before they get dried out, so a smaller batch is better. Or, if you're like me and have the metabolism of a rhino but still can't physically stop yourself from eating a whole pan of brownies, then a small batch may save your life... uh... hips. Anyway, here's my famous super-fudgy brownie recipe. We have made them with both wheat flour and spelt, and both work. Also, the nuts are theoretically optional, but I find that the batter gets too thin without the extra bulk. I use the food processor to cut them extra fine so they just blend into the texture of the brownie. If you don't like nuts, you might try oatmeal or something else to get the same volume. 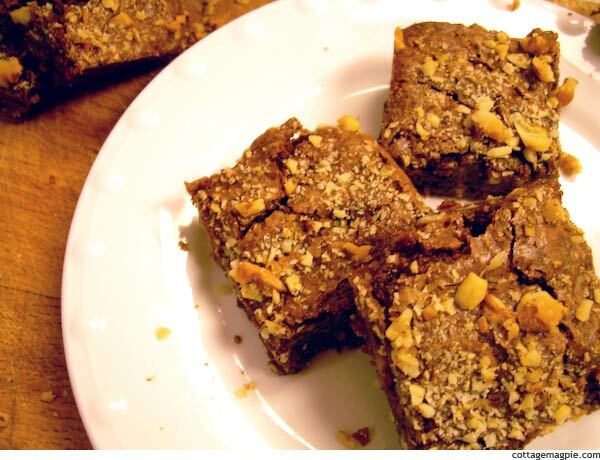 Updated: If you're feeling frisky, you can also make these with Roasted Hazelnuts, then add English Toffee and Whipped Cream and have the mega-decadent Hazelnut Toffee Brownies. Oh, yeah. 1. Preheat your oven to 350 degrees. 2. Prepare your pan. 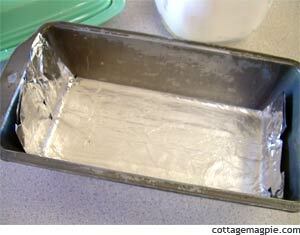 You will need a regular bread loaf pan and a small amount of foil. Butter the bottom and sides of the pan, and then carefully fit a long strip of foil onto the bottom of the pan. It needs to be as wrinkle-free as you can make it. Make sure the strip is long enough to extend up the ends of the pan; these will serve as handles to pull the brownie out of the pan later. Then, butter the foil as well. You do need to butter both so that if the batter leaks around the foil it won't stick. 3. In a medium-sized, microwave safe bowl, put the 3 T of butter and the baking chocolate. 4. Microwave the chocolate and butter in 20-30 second bursts, stirring in between bursts, until the chocolate is almost completely melted. Stir to melt the last small lumps. 5. Using a wooden spoon, beat in the sugar, egg, vanilla, flour and salt, one ingredient at a time. 6. Stir in most of the nuts (or nut substitute) and spread into the loaf pan. 7. Sprinkle the rest of the nuts on top of the batter. 8. Bake until a toothpick inserted in the center comes out with moist crumbs attached, 20-25 minutes, or longer if you prefer drier brownies. 9. Remove from the oven, lift the brownies onto a cooling rack, and let cool completely. 10. When cool (or as cool as you can stand waiting for), carefully peel the foil from the bottom of the brownies, cut and serve. Enjoy... and try not to eat them all in one sitting. Not that I know what that's like. Ahem.